이 개발 프레임워크 관련 내용은 http://kingcrap.com 블로그 장현춘님의 허락을 받고 가져온 글이며, 모든 저작권은 장현춘님께 있습니다. 많은 개발자들이 기다려온 Enterprise Library (EntLib) 5.0이 2010년 4월에 출시되었다. EntLib는 개발 과정에서 늘 고민하게 되는 공통적인 코드 블럭들을 마이크로소프트가 전세계 개발자들과 함께 고민하면서 발전시켜 나가고 있는 라이브러리성 프레임웍의 모음집이다. 시장에는 이미 많은 오픈 소스 기반의 라이브러리들이 있어 개발자의 노가다를 줄여주고, 시장에서 검증된 성능의 품질 좋은 코드셋을 앞다투어 쏟아내고 있다. 여기에 마이크로소프트도 거대 닷넷 생태계에 일원으로 참여하고 있는 것이다. EntLib 5.0은 이전 4.1버전과 마찬가지로 아래와 같은 9개의 application block들로 구성되어 있다. 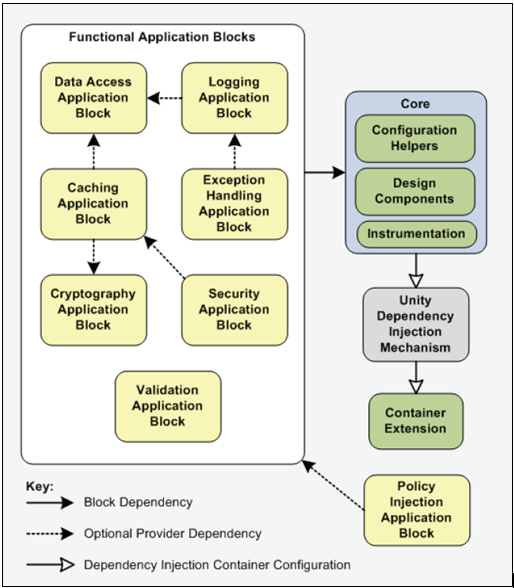 Developers can use this application block to incorporate a cache in their applications. Pluggable cache providers and persistent backing stores are supported. Developers can use this application block to incorporate hashing and symmetric encryption in their applications. Developers can use this application block to incorporate standard database functionality in their applications, including both synchronous and asynchronous data access and returning data in a range of formats. Developers and policy makers can use this application block to create a consistent strategy for processing exceptions that occur throughout the architectural layers of enterprise applications. Developers can use this application block to include logging functionality for a wide range of logging targets in their applications. This release further improves logging performance. Powered by the Interception mechanism built in Unity, this application block can be used to implement interception policies to streamline the implementation of common features, such as logging, caching, exception handling, and validation, across a system. Developers can use this application block to incorporate authorization and security caching functionality in their applications. Developers can use this application block as a lightweight and extensible dependency injection container with support for constructor, property, and method call injection, as well as instance and type interception. 각 application block 사이의 dependency는 아래와 같다. 좀 더 상세한 정보를 볼 수 있는 싸이트로는 다음과 같은 곳이 있다.